When I wrote about my search for avocadoes in Kuala Lumpur last year and included a recipe for a sort-of Indonesian avocado shake, I was kinda hoping some creative cook of a reader would head into the kitchen, take it a step further, and come up with a recipe for avocado ice cream. Well, that didn't happen - but avocado fans should have a look at this recipe for avocado-coconut ice cream that landed in my mailbox this morning, courtesy of tuttiefoodie.com. If I were home I'd be heading to the avocado section of Chow Kit Market ASAP. Early in the morning last December 24th we were, like many around the world, anticipating a feast. But this was to be no dinner or turkey or roast beef or roast lamb or ham. We'd been invited to village about an hour from Kuala Lumpur to watch the preparations for a kenduri (Malaysian for 'ceremony' or 'celebration'). This particular kenduri was to mark the engagement of my Malaysian teacher's sister. 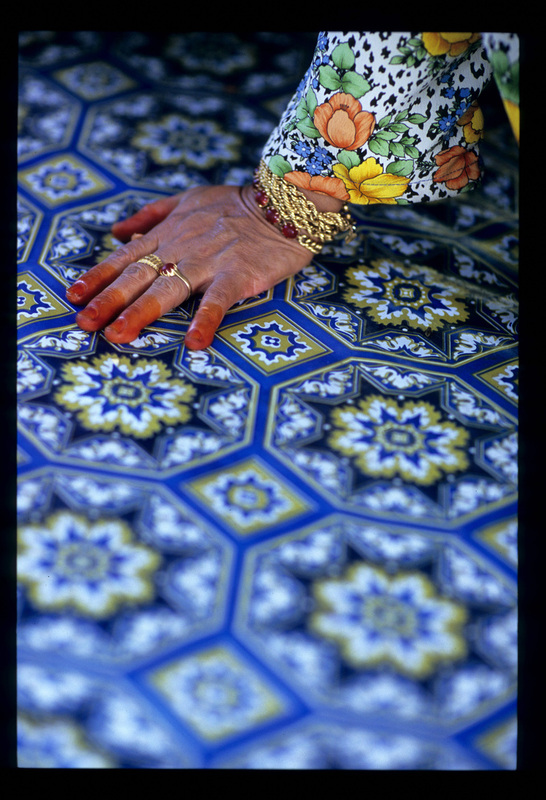 All kenduri involve protocol - there are must-do's and must-don'ts; dress should be appropriate, and ritual respected. But this is Malaysia, a country where food is never an afterthought. So, as the betrothed-to-be prepared herself for the afternoon's events, assorted relatives and neighbors cooked up an amazing meal for the guests. We arrived early to find M's grandmother sweeping the courtyard and his father on a ladder plucking rambutan from one of the many fruit trees that shade the house. Cats lazed about here and there in the early morning sun. 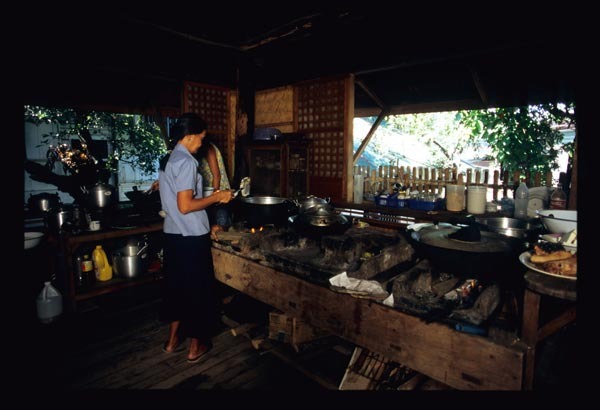 Preparations had already begun at the bangsal, an outdoor raised and covered platform that's usually used for lounging but that can be called into kitchen use when the weather is fine and extra space is needed. M's family expected 100 or so guests for lunch, so caterers were called in - a few village ladies, reknowned for their culinary skills, who have experiece cooking for crowds. 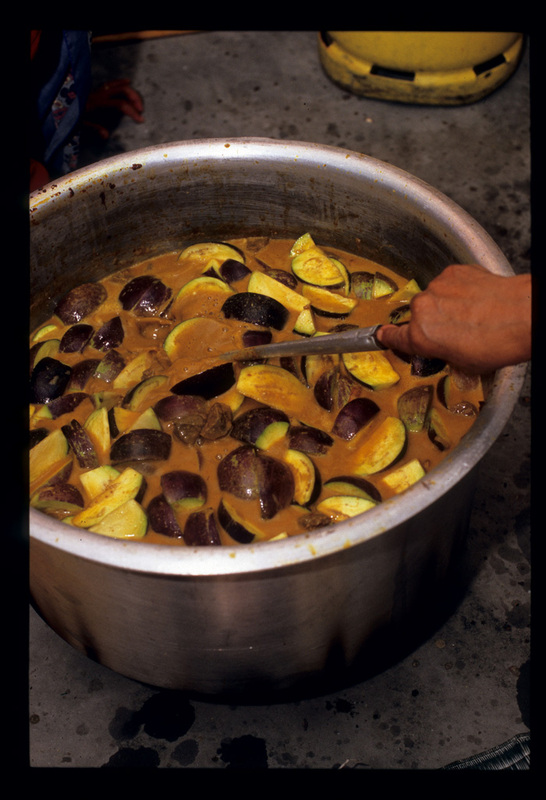 They arrived with huge pots of half-cooked curry sauces that would be finished off in the one-room hut opposite the house that serves as a second kitchen. 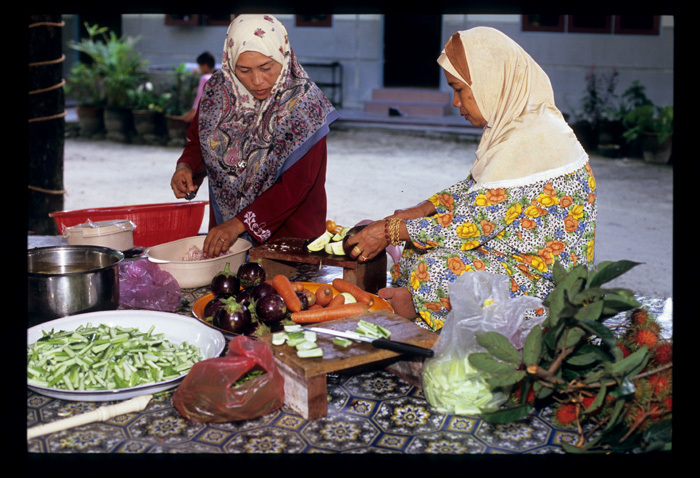 These ladies may have been asked in to do a job, but when it came to cooking, everyone - M's sisters and mother included - deferred to Aunty, a sturdy and smiling 69-year-old relative who'd been driven in from Kelantan state for the occasion. 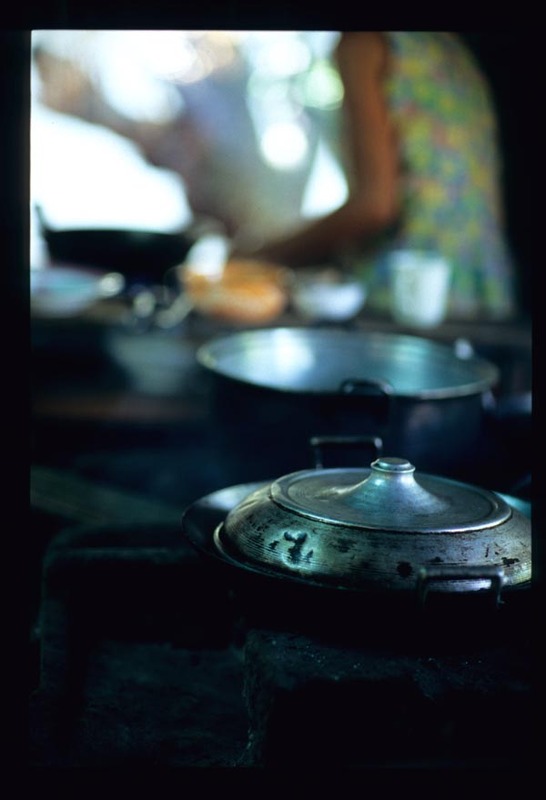 After chopping carrots and longbeans at the bangsal she moved to the power position in the cooking hut - a low stool within easy reach of ingredients and a couple of portable gas burners - and, with the village caterers, set to finishing the meal. 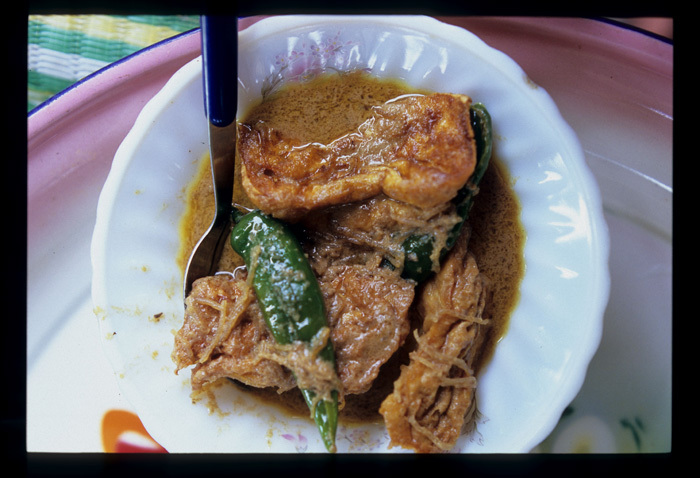 Mul bari is a sort of curry made, on this day, with chicken. Aunty started by heating the brick-red sauce, made with loads of dried chilies, onions, shallots, and ginger, and then added chicken pieces that had been marinated in serbok kuzi - a mixture of garlic, ginger, and condensed milk - and then deep-fried. 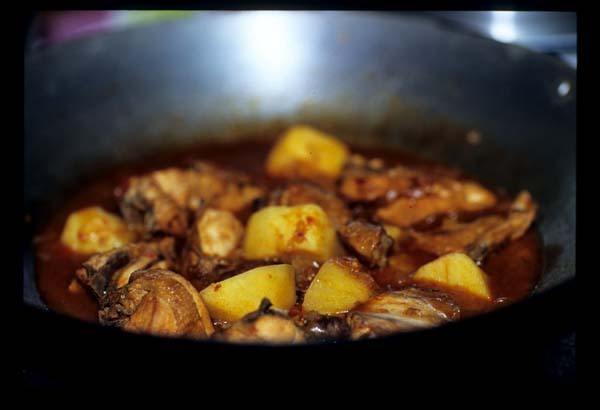 The pan holding the curry sauce was large, but the amount of chicken to be cooked larger, so Aunty added the bird in batches, leaving each to simmer in the sauce for a half an hour or so before removing it to make room for more. Once all of the chicken was cooked and removed from the pan, in went chunks of red onion and long red chilies, halved. 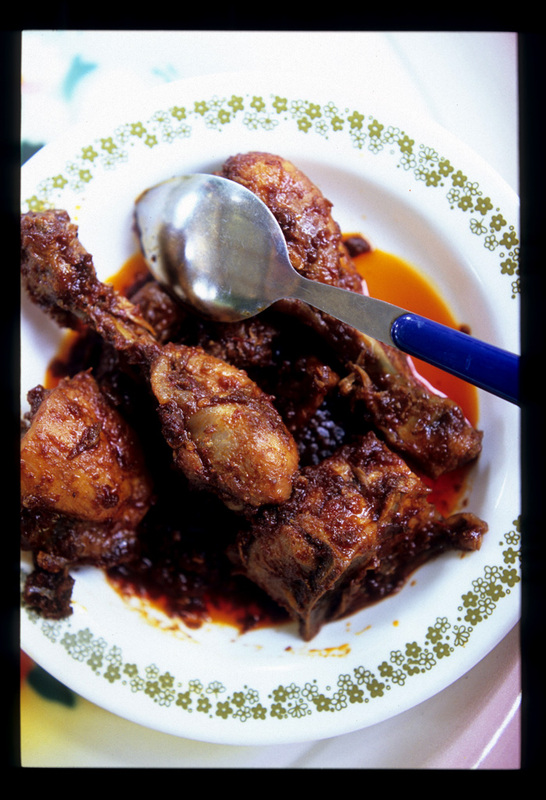 After they'd simmered and softened for another thirty or minutes or so Aunty added the chicken back in and finished the dish with a flurry of curry leaves. This spicy, fragrant dish with its textured sauce was our favorite of the meal. 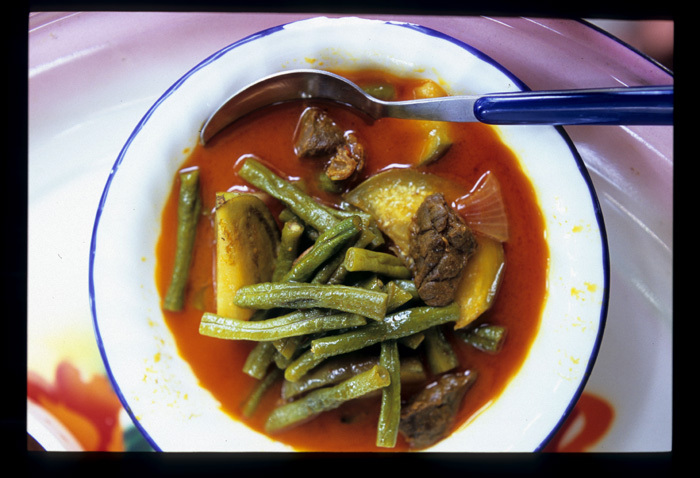 Dalca, a dish of vegetables and protein (beef stomach, in this case) is a Malay dish with Indian influences - the sauces incorporates dal, an Indian pulse. 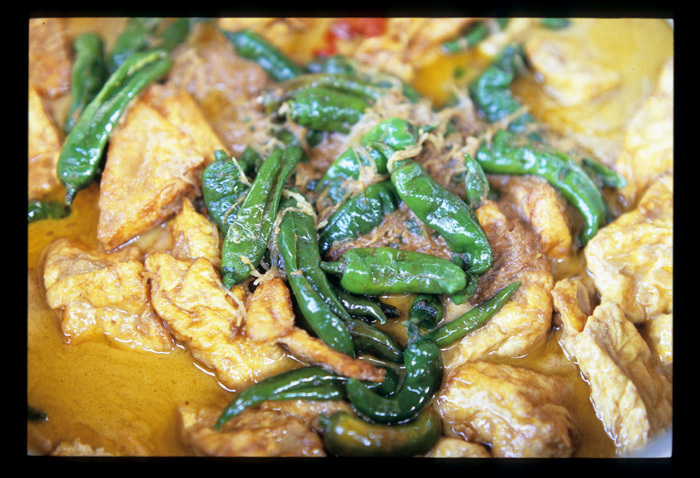 Dalca includes plenty of chilies as well, though the heat is softened by coconut milk. 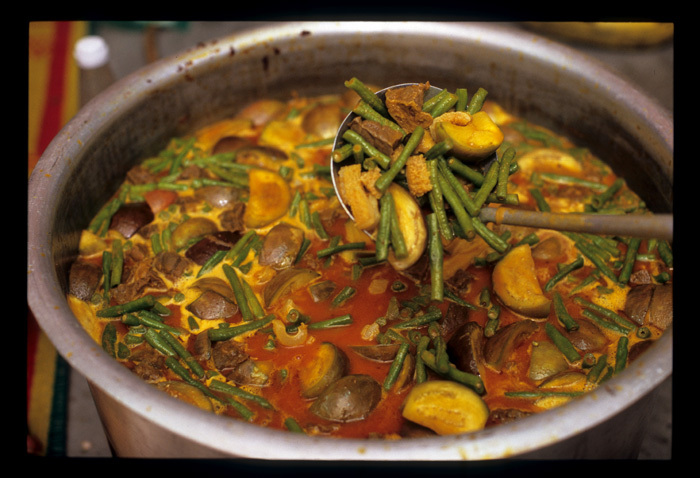 Long beans, globe eggplant, and potato round out this Malay-Indian stew. 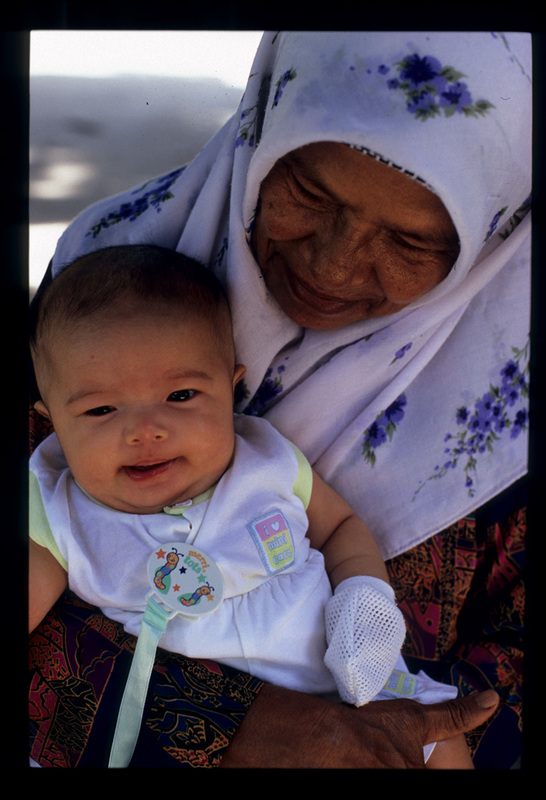 Most of the residents of M's village trace their ancestry to Bengkulu, a coastal town in southern Sumatra (M's family hails from peninsular Malaysia's east coast). Bengkulus were brought to this part of Malaysia in the latter part of the 19th century to work on rubber palm plantations as tappers. 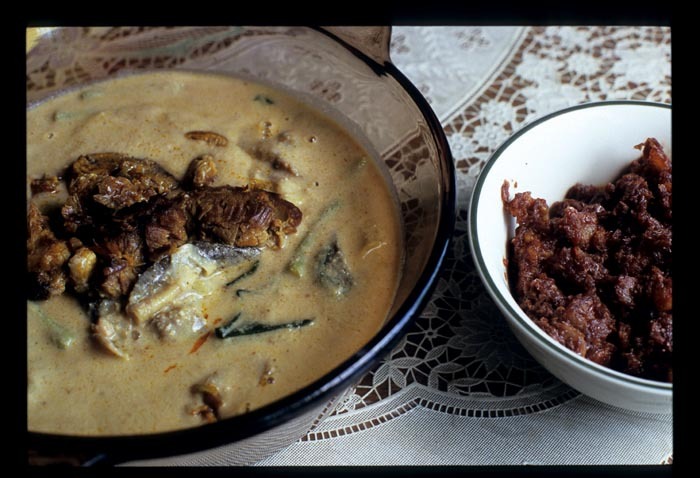 This tahu masak kicap (tofu cooked with soy sauce), a dish of deep-fried tofu and fresh green chilies in a rich coconut milk sauce, is part of the Bengkulu culinary repertoire. 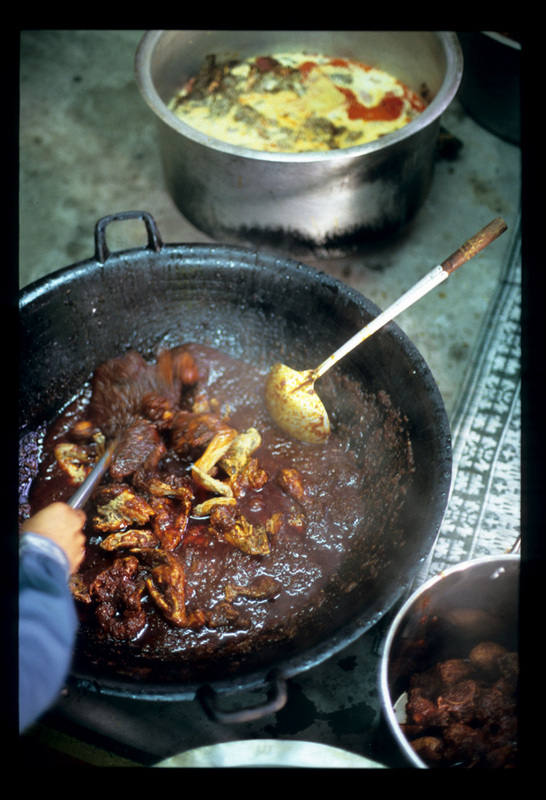 It includes both regular and Indonesian sweet (kecap manis) soy sauces. The ginger-fragrant dish was a perfect sweet-salty addition to a menu otherwise dominated by spicy foods. 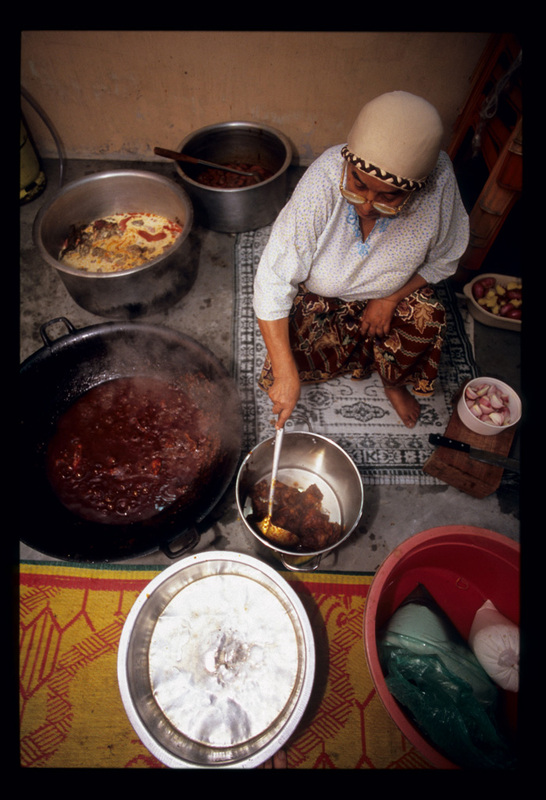 the other caterer prepared nasi minyak ('oil' rice) for one hundred, in two batches. Each started with a heart-stopping amount of butter and ghee, melted in an oversized rice cooker. 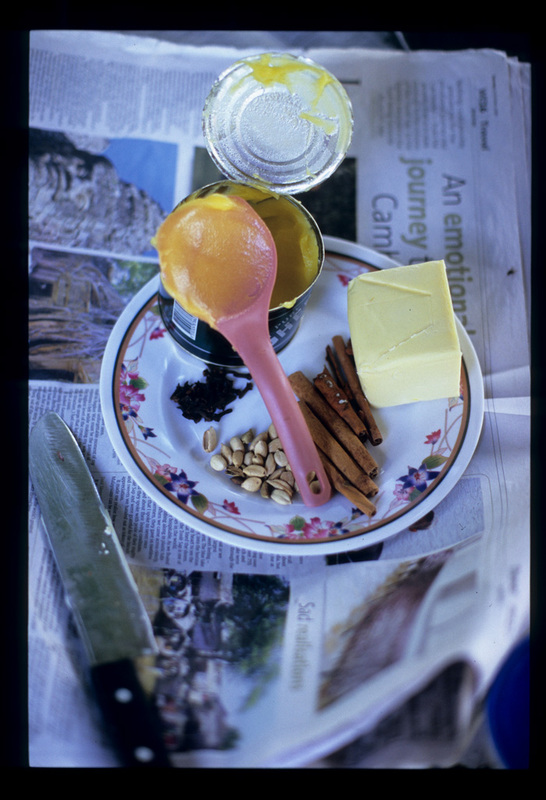 Once she had melted the oils and allowed them to bubble a bit the caterer threw in dried spices - whole cloves, cardamom pods, and cinammon sticks - and chopped garlic and ginger, and stirred the lot with a wooden paddle large enough to be a boat oar. 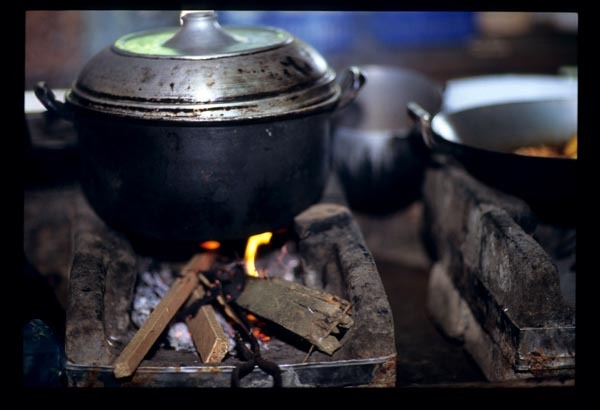 Seven and a half kilos of rice followed, then water, and then the lot was left to steam. Halfway through the cook removed the lid, flattened the rice with her paddle, and pressed a banana leaf on top. After more steaming, she mixed in golden and black raisins. 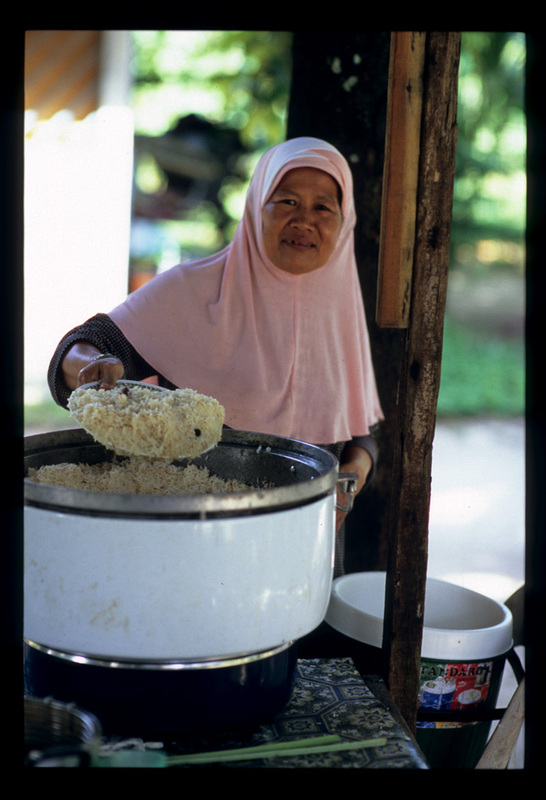 Fifteen or so minutes later she dished up perfectly cooked (each grain distinct), fragrant rice to accompany the meal. 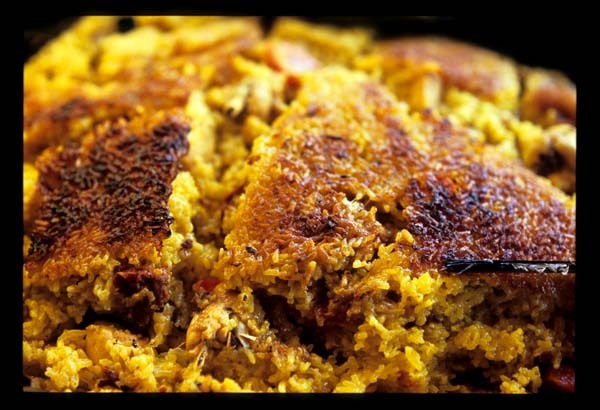 No kenduri is complete without pulut kuning (yellow rice), rice that has been soaked with turmeric for two hours, drained, and then steamed with coconut milk. The finished dish is a bit al dente, like a risotto, and delicious, though much too rich to be eaten in quantity if other dishes are on offer. 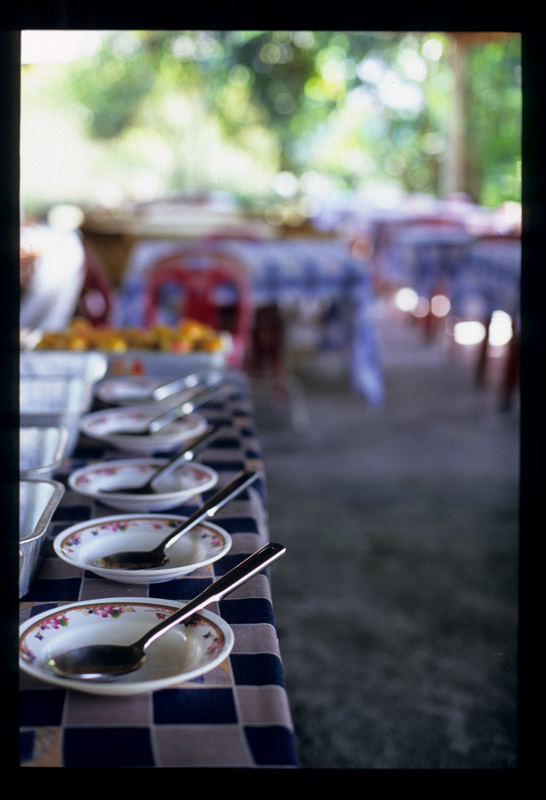 Around 12:30, after four and a half hours of chopping and washing and boiling and simmering and steaming, the caterers and their helpers, along with M and his guests, gathered on the bangsal for lunch. Guests were to arrive at 2 but we were all much too hungry to wait. Along with the rices, and the dalca, chicken, and tofu, there was a rich beef rendang, a chile-hot and belacan-fishy sambal, and a wonderfully refreshing acar (a sort of pickle/salad) of red onion, fresh red chilies, garlic, tomatoes, pineapple, shredded carrot, and cucumber in a sweet-sour-salty white vinegar-based dressing. We ate until we could eat no more, and then went inside with M to see the hantaran, or gifts that the bride-to-be's family had prepared for the groom's family, who were driving in from Terengganu (it's a Malay tradition for the families to exchange gifts at the beginning of the engagement celebration). 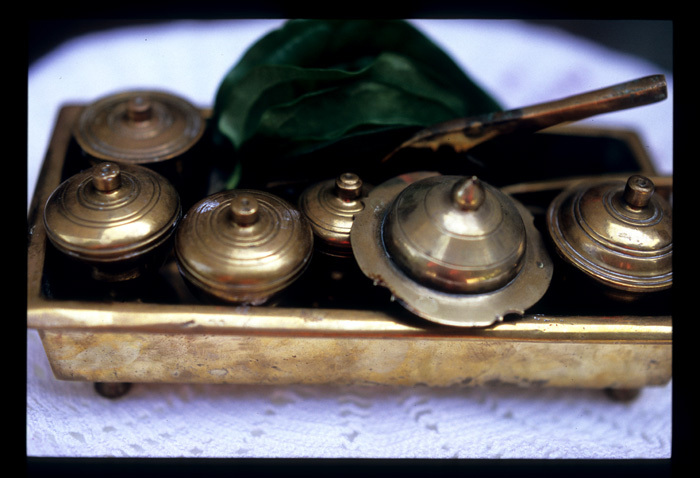 Among kuih (sweets) and textiles was this beautiful old tepak seri, or betel set. 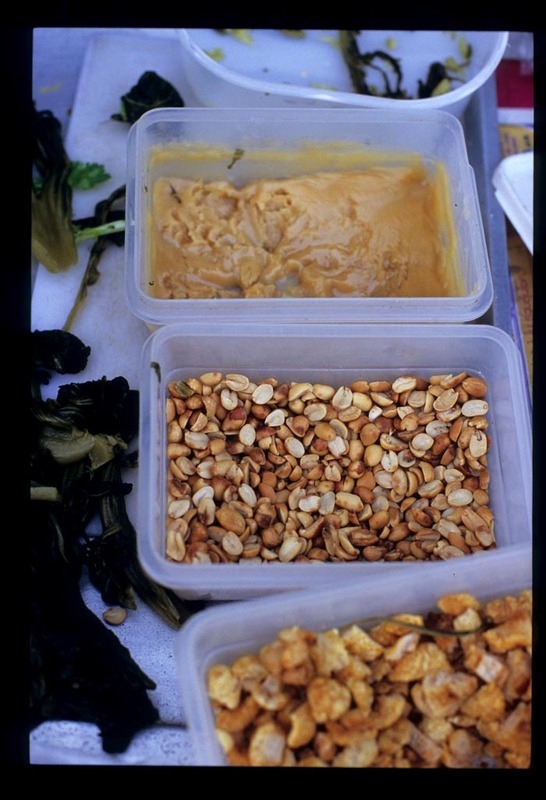 The lidded containers are meant to contain ingredients to wrap with the nut in its leaf, before it's popped in the mouth. Just as we were about to leave, grandma emerged from the house in her kenduri finery. We weren't able to stay for the engagement ceremony itself because we'd been invited to a tradition of an entirely different sort. Our neighbors were holding a Christmas Eve open house. Thanks to M and his family for so warmly welcoming us into their home. We're headed back to the US for a few weeks. But first, a stop in Pampanga province, Philippines, to witness some exuberant - to say the least - Holy Week festivities and feast on local delicacies. 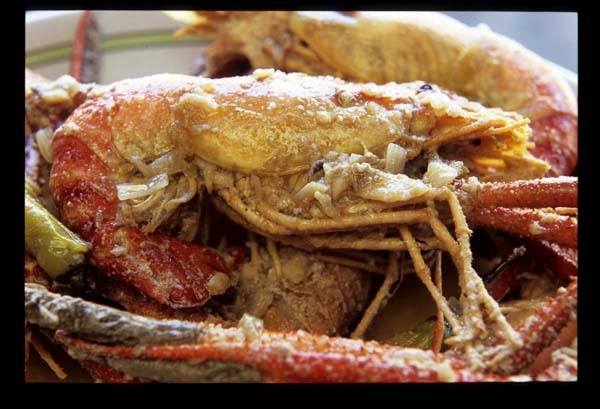 Filipinos know Pampanga as the 'gourmet province', so we should have some fine culinary moments to share when we return. As for posting, for the next few weeks think 'quality', not 'quantity'. We'll be posting, but not quite as often as usual. EatingAsia is among 'the best in global blogging, podcasts, and opinion' - that, according to PajamasMedia which - for today or perhaps just for this moment - includes our post on Philippine kinilaw et al. on its 'front' page. Thanks also to Global Voices Online for linking the same post. 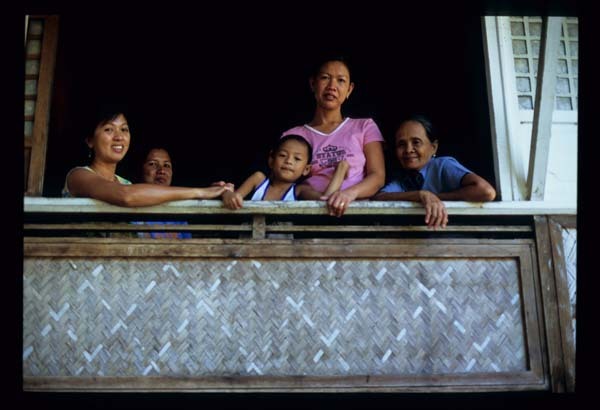 If Thailand is the Land of Smiles, then the Philippines is the Land of 'Come On Over!' 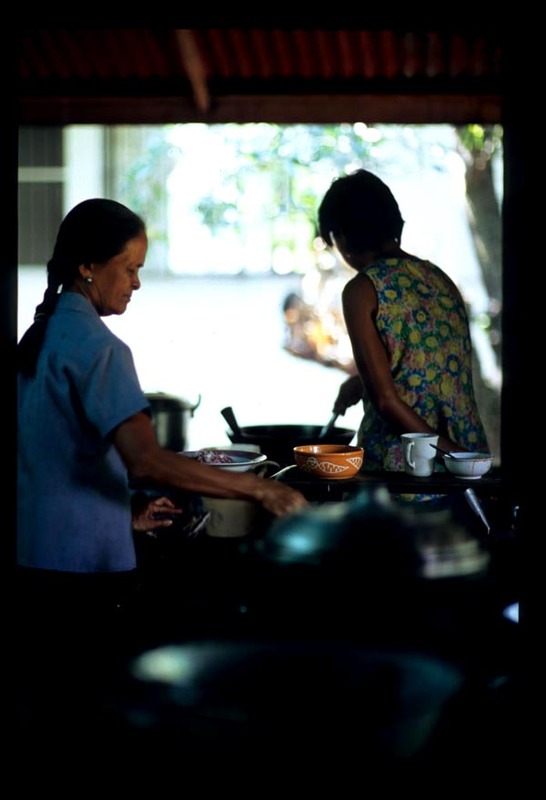 In just a little over a week in Manila - a city where we knew not a single soul before we arrived (we had some introductions ... but we knew no one personally) - we were treated to two home-cooked meals. Not meals, really, but veritable feasts. Via a connection made on an internet food forum (oh c'mon, it's de rigeur to meet people on the web these days) we hooked up with Rody and Cora, an energetic retired couple of Cavite natives who treated us like long-lost relatives from the moment they met us at Manila's airport. 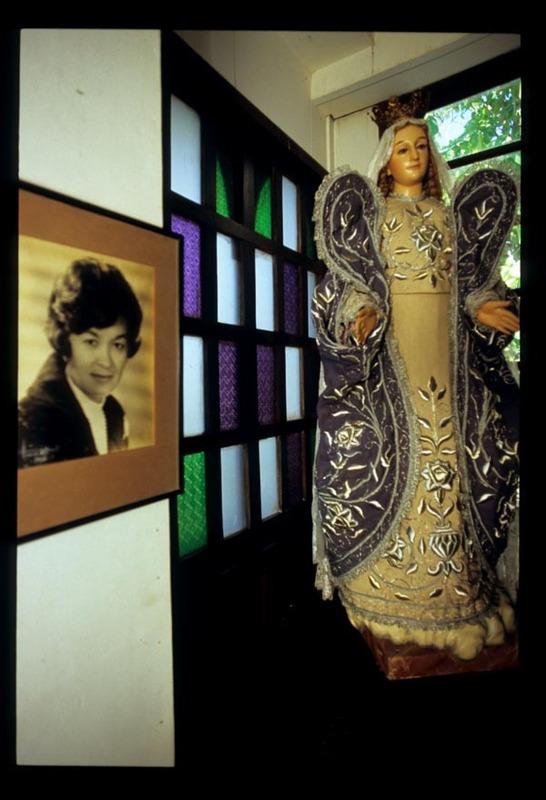 Thanks to Rody's former position with a major Philippine corporation the couple has lived all over the country, with Cora collecting recipes as they moved from place to place. We joined them - and their son and one of three daughters and spouses and kids - at their house for a Sunday afternoon feed. When Dave and I walked into the light, airy room that serves as combination kitchen-dining area-hanging-out-spot the table was already groaning ... and there was more to come. I arrived in the Philippines keen to try kinilaw, a dish of protein (usually fish, but it may be otherwise) 'cooked' with a souring agent. Kinilaw could be considered one of the country's national dishes - there are as many variations as there are Philippine regions, perhaps even as many variations as there are Filipino cooks. My appetite for the dish had been whetted by a thorough reading of Edilberto Alegre and Doreen Fernandez' Kinalaw: A Cuisine of Freshness, a used copy of which a Filipino friend had kindly (or cruelly, considering the dearth of Philippine ingredients available in Kuala Lumpur) sent me months before, when we were preparing for our trip. Cora was game, and served up a fantastic version made with mackerel, cane vinegar (other Philippine vinegars are made from nipa and coconut palms), kalamansi juice, lots of fragrant ginger, and tiny chilies called siling labuyu that are so wickedly hot they make Thai prik kee nuu seem seem like candy (opening photo). The balance of sour, spicy, and fruity (from the kalamansi) in this dish - not to mention the sparkling freshness of the fish - made this dish what Dave delicately terms a 'shoveller' (as in, you just want to keep shovelling it in). I could have eaten the whole bowlful, had I been left alone in the room with it. But I had to leave room for a light, ginger-fragrant stew of mussels and green papaya. 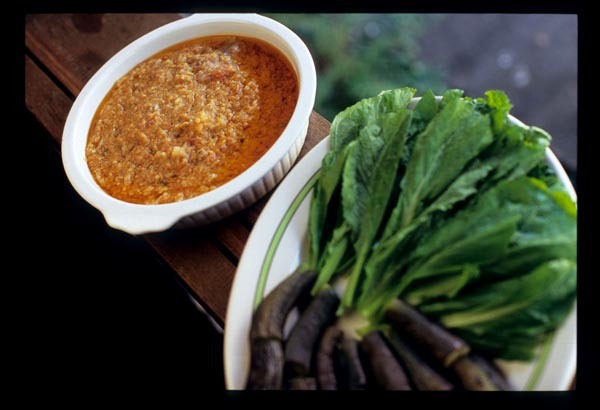 According to Cora, in the Philippines kare-kare is a must if visitors are coming for a meal. This dish of meat in a sauce thickened with pounded toasted rice and peanuts (modern versions might substitute peanut butter) is classically paired with bagoong na alamang, fermented shrimp paste. It's sinfully rich but supremely comforting. 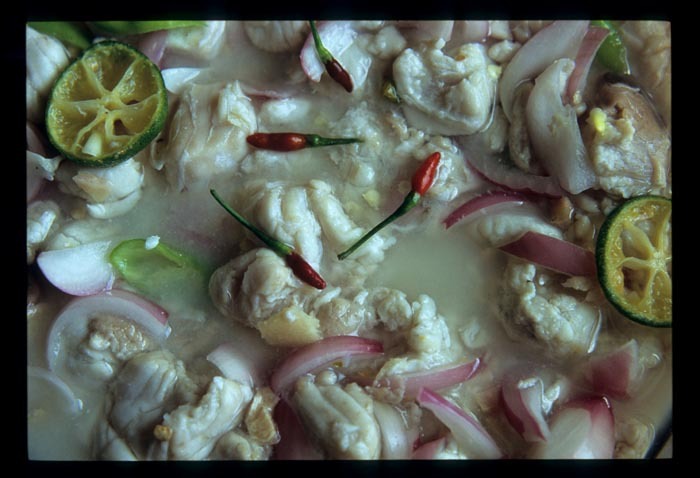 Like most most southeast Asians, Filipinos are fond of fermented foods. 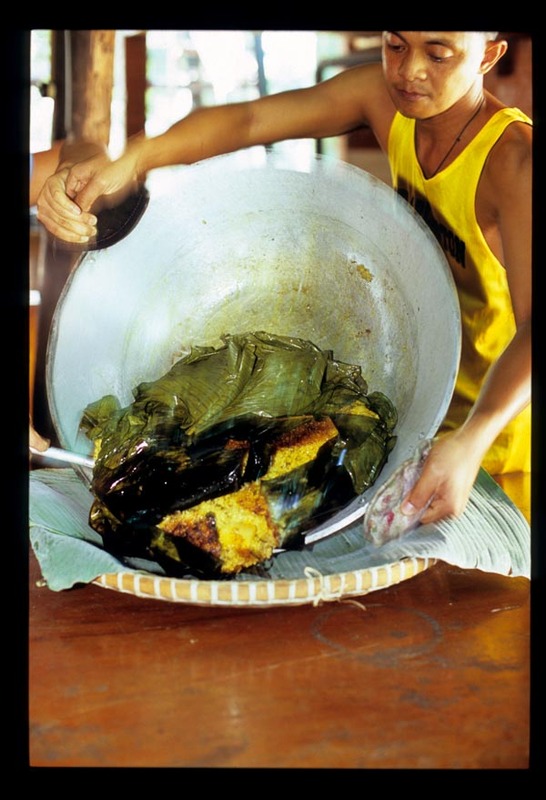 Fish and shrimp are fermented into bagoong (similar to Thai bplaa raa and Malaysian cincalok). Kapampangans (natives of the province of Pampanga) ferment pork with rice to make burong baboy and subject fish to the same treatment, to an exceedingly stinky but - to my taste buds - heavenly result, especially when eaten with mustard leaves. 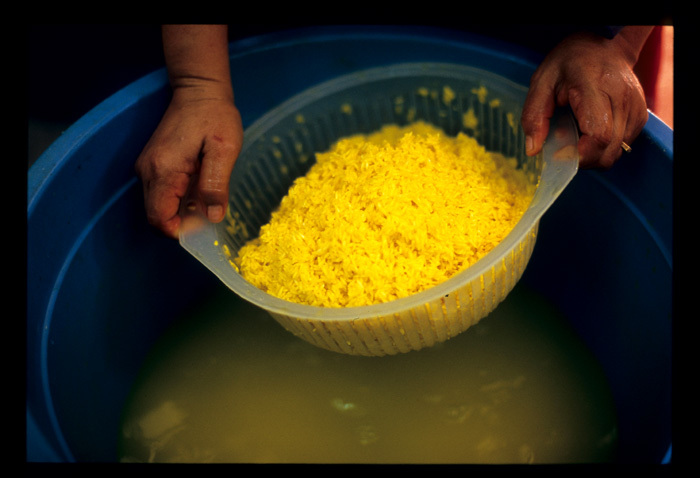 Cora introduced us to burong mangga, a simple condiment of green mango and grated ginger fermented in salted liquid. We found its gingery tartness to be a delicious palate cleanser. Kitchen wizardy runs in this family. Several dishes for our feast were contributed by Cora and Rody's son John who, when not overwhelmed with the demands of his job in IT, likes to spend time at the stove. This is a guy who spends weeks baking Christmas cakes to give to friends, family, and colleagues. 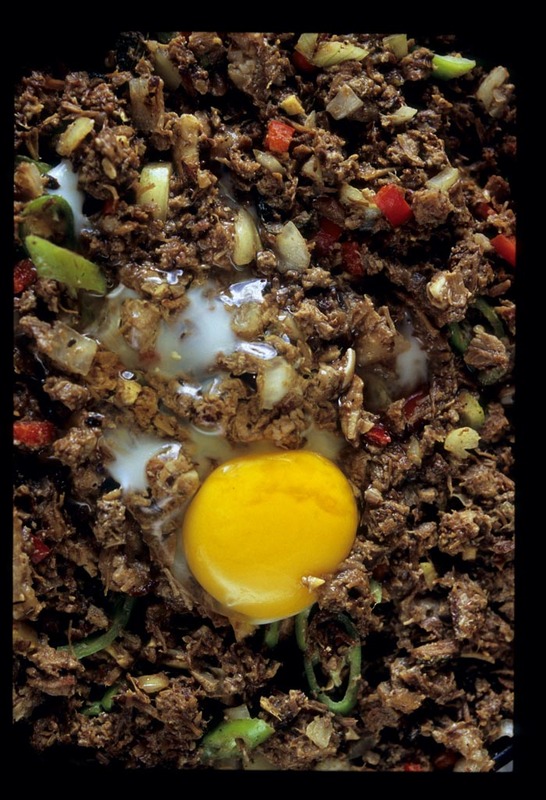 His sizzling plate of sisig - a roasted pig head, chopped (cheeks, snout, ears, and brain) and mixed with spices - filled the room with a fragrant, porcine cloud of goodness. This was our first time for pig brain, and we have to admit its attractions. 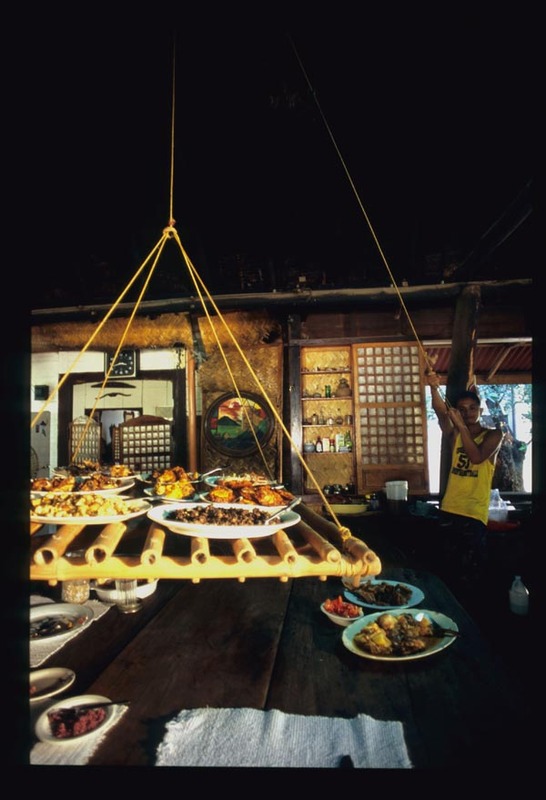 But this is rich, rich stuff - Philippine drinking food, according to John, not meant to be eaten in copious amounts as an entree - and a spoonful or two will do you. Pancit, a dish of any of a variety of noodles prepared in any number of ways, gets a bad rap from travelers to the Philippines. They complain of mediocrity and monotony. 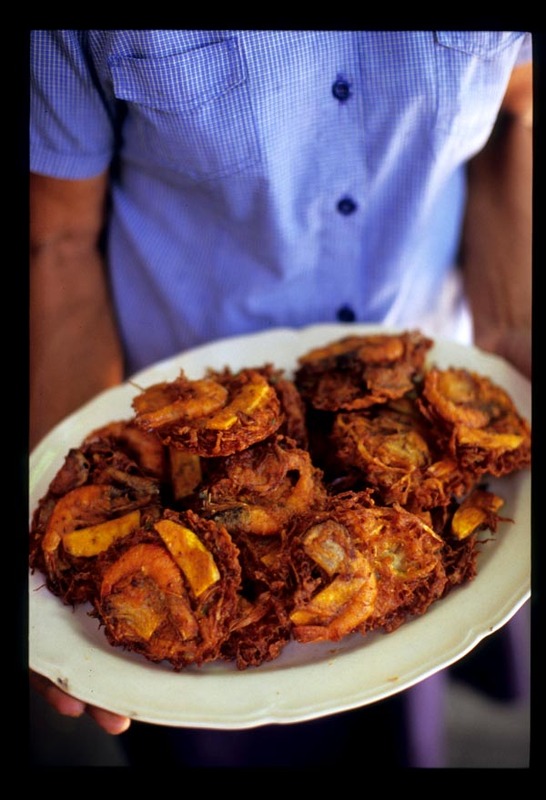 We enjoyed a number of memorable versions on our trip, and John's fried pancit with vegetables and meat and a shower of golden, caramelized onions, were one of the best. There were more dishes to this meal, but I gave up taking it all in and writing it all down about halfway through the afternoon. We remember the day for the wonderful food, of course, but also for the ceaseless conversation that revolved around food (perhaps at our prodding), tips and tidbits that set us up well for the following week of market exploration and food producer visits. 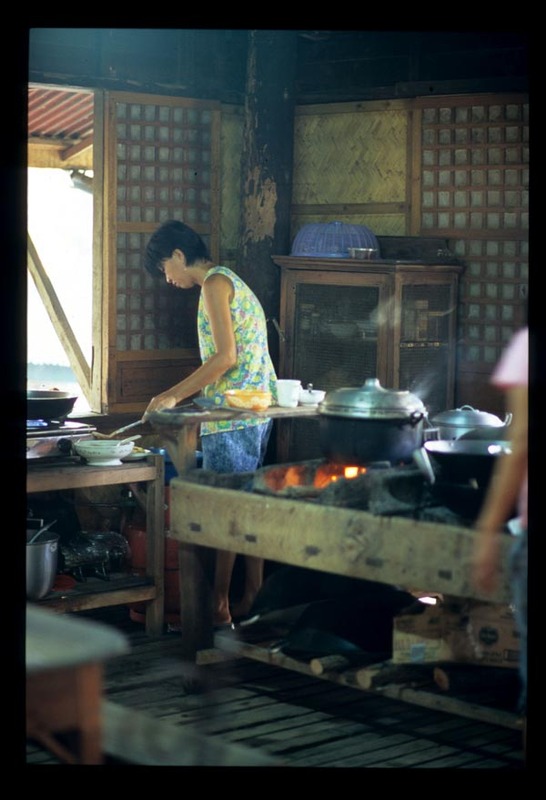 Much culinary knowledge floated around the sitting area that afternoon, and we were struck by how much Filipinos remind us of Malaysians in their knowledge of, and utter passion for, their own cuisine. Reason enough for a return trip. Many thanks to Cora and Rody and their family for welcoming us so warmly into their home (Dodie, thanks for introducing us to your mom and dad). We're sorry that we were so busy eating Dave forgot to snap a family photo! Kinilaw is a personal thing, made to taste from whatever is on hand. So consider the amounts below to be approximate. Taste as you go, and substitute other seafood, if you like. Snapper would be lovely, prawns would work. In some parts of the Philippines a bit of coconut cream is added at the end. 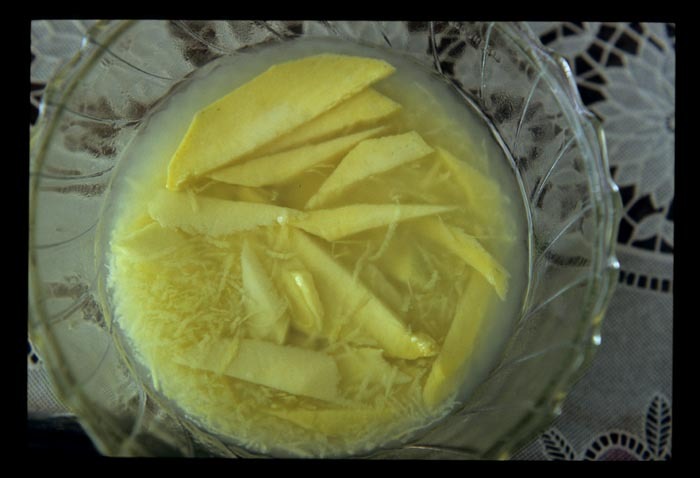 However you make it, the end result should be sour.Filipinos have access to wonderful cane and palm vinegars. Rice vinegar might be a substitute. Serve the kinilaw soon after it's mixed. 1. Wash the fish twice in cane vinegar, to get rid of excessive fishiness. Place it in a bowl and add the salt, kalamansi juice, ginger, red onion, and the cayenne peppers and mix. 2. Squeeze over the kalamansi halves and add the vinegar and water and mix again. 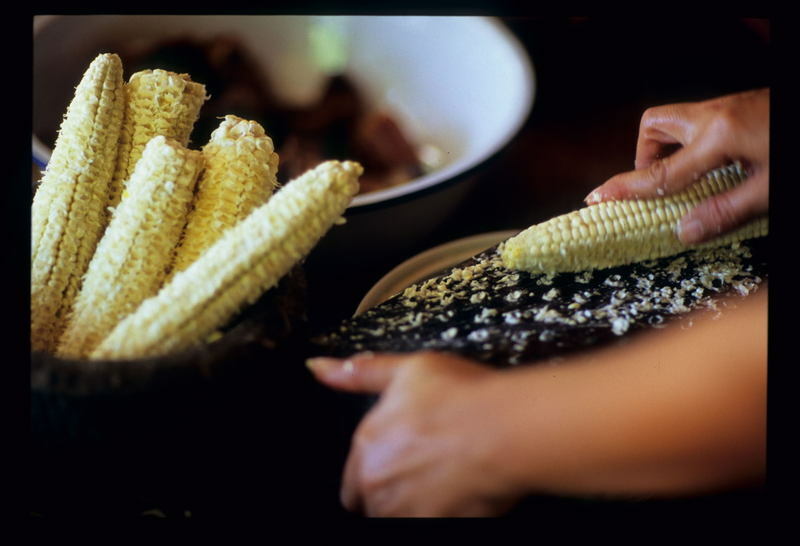 Serve, garnished with the small whole chilies (diners seeking heat can eat bits of the chilies along with their kinilaw). 1. Place the green mango and ginger in a 500 ml/2 cup clean glass jar or other glass container. 2. Add the salt and fill to the top with water. Seal and leave to ferment at room temperature before serving or refrigerating for later use. I've yet to meet a Thai food-addicted farang who doesn't love miang. 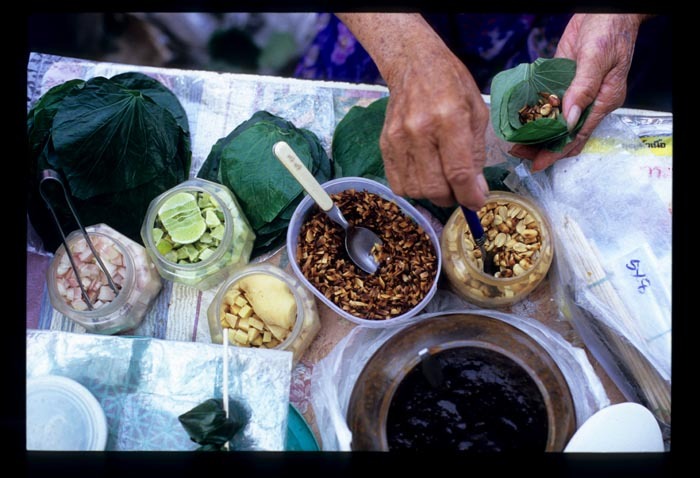 These leaf-wrapped bundles of joy are the taste of central Thailand in one neat bite: heat from fresh ginger and shallots, tartness from lime, saltiness from peanuts, and sweetness from toasted coconut and a jam-like sauce made from palm sugar, tamarind, and fish sauce. I'm betting that miang is the most-often ordered Thai appetizer in the world. Interestingly, though miang is most often found on restaurant menus featuring central Thai standards like green chicken curry and tom yam gong, it isn't a central Thai invention at all. 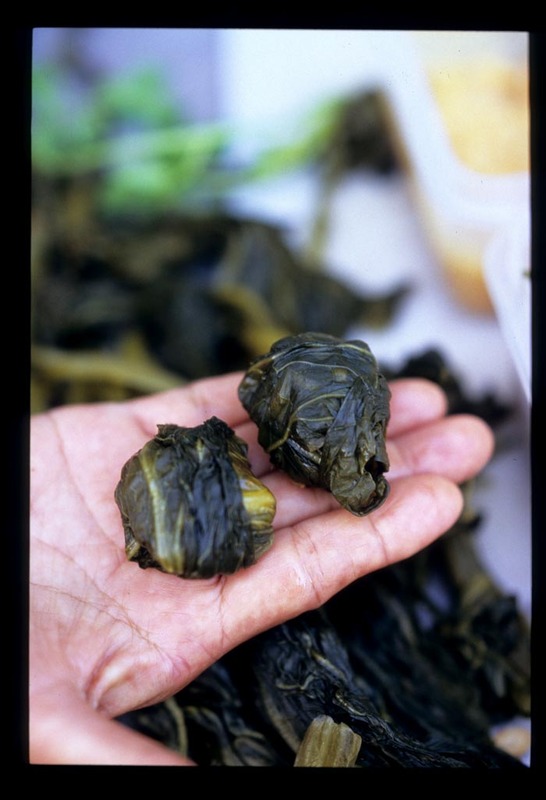 David Thompson writes that it originated in Thailand's north, near the Burmese border, and migrated south, where it took on the central Thai hot-sour-salty-sweet flavor profile. In Thailand miang isn't an appetizer unless you're in an upscale restaurant. It's simply a street snack, sold morning to evening. Imagine being able to pick up a skewer of these treats anytime the urge strikes. 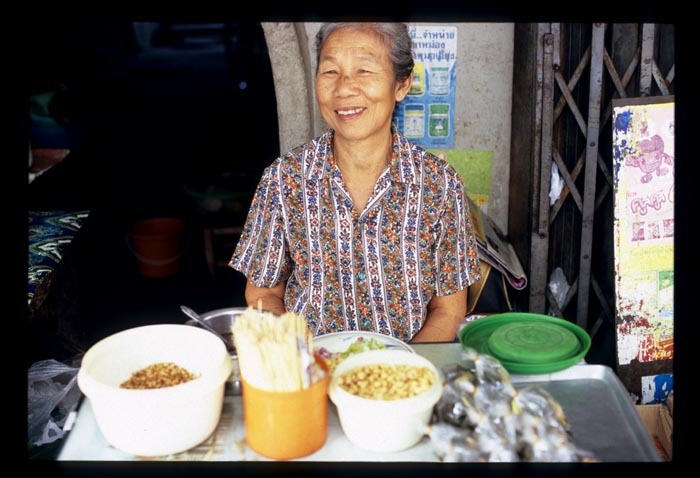 Outside a morning market in Lampang, a pleasant northern Thai town about an hour south of Chiang Mai, a central Thai-style miang vendor is doing a roaring business. It's only 9:30 but we're dragging from the heat, feeling a little peckish ... a light, highly seasoned mouthful seems just the thing at a moment like this. Hers is a streamlined operation, all ingredients lined up within less than an arm's reach. 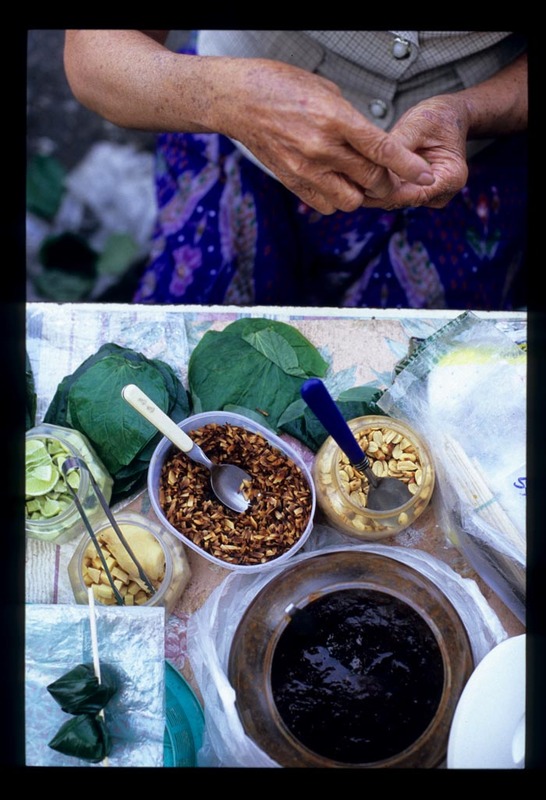 She starts with blanched piper betel leaves and then piles it on: shallot, lime, ginger, and toasted coconut (opening photo). and a generous spoonful of her homemade sauce. and slide the finished product onto a skewer. 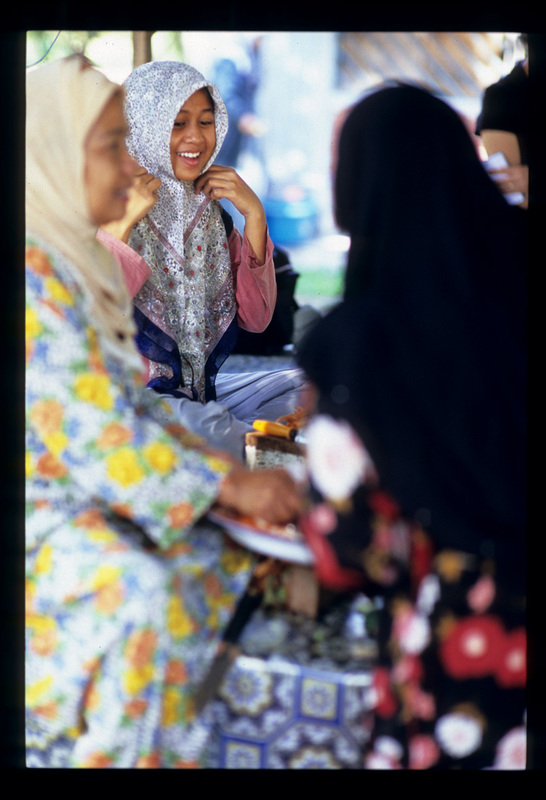 Around the corner, another miang vendor. 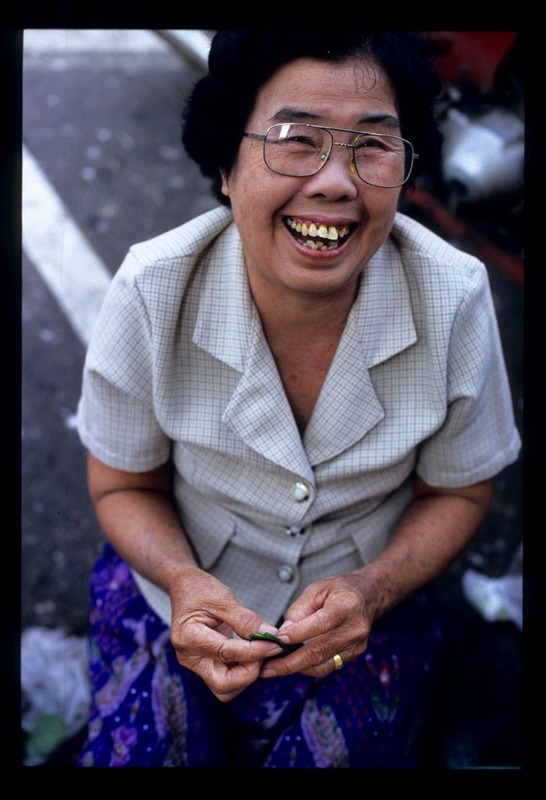 Her table holds identical miang makings, except that her piper betel leaves are fresh. Verdict? We prefer number two, for the crunch and freshness her leaves add to the mix. But vendor number one wins for the most high-pitched cackle. Having just rolled into in Nan, capital of the northern Thai province of the same name, we make a beeline to its fantastic evening market. 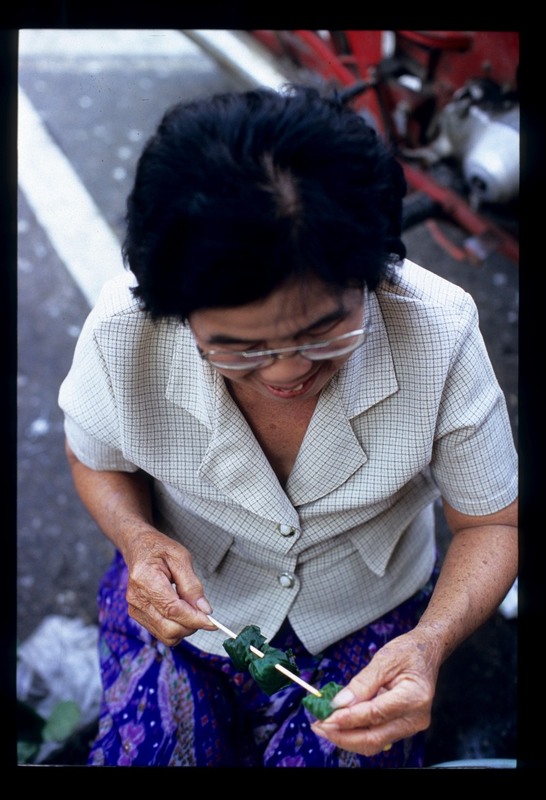 There, we find a vendor rolling northern-style miang Lao - named, we assume, for the country that Nan shares a 140-mile border with. 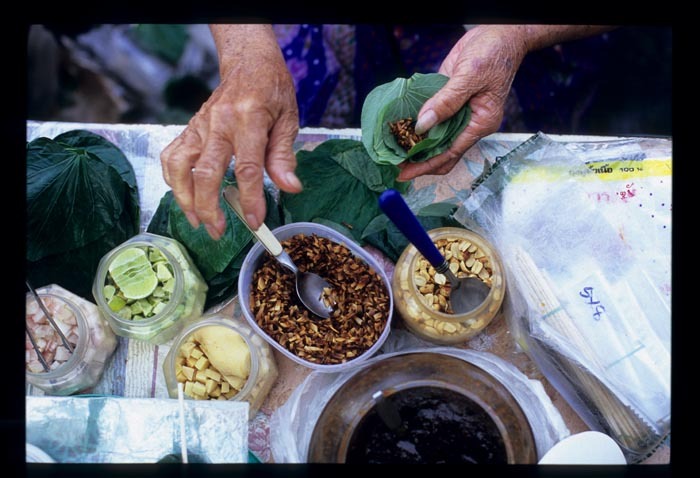 Like central Thai miang, miang Lao is a region in a mouthful. Northern Thai preparations draw maximal flavor from minimal ingredients. 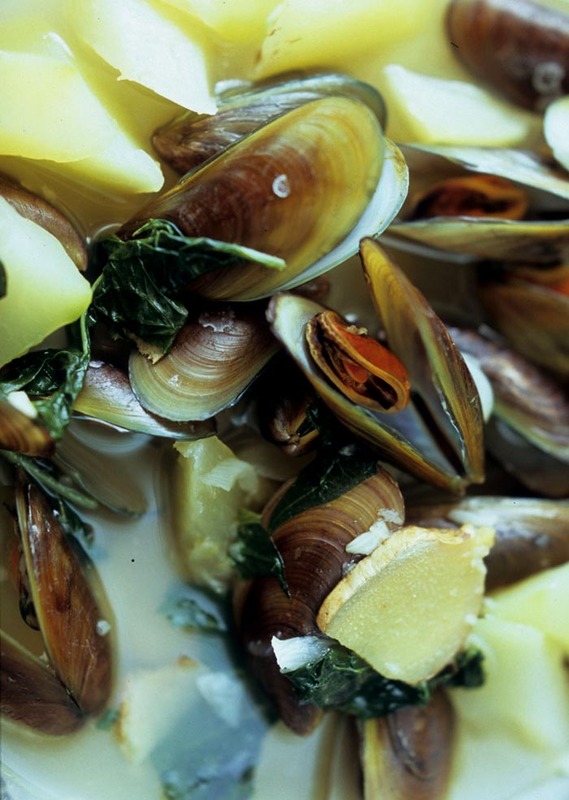 To us, the region's food is the embodiment of unpretentious, down-to-earth deliciousness. It's hot and salty, sometimes sweet, rarely sour, often bitter - rustic and never, ever timid. 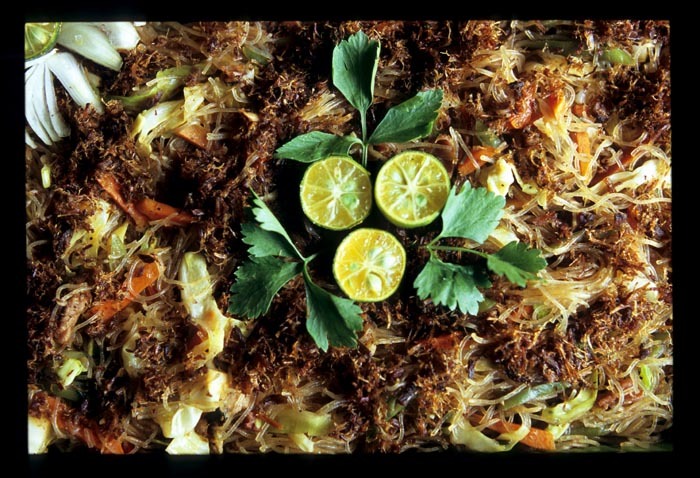 Miang Lao is made with pickled cabbage or mustard. 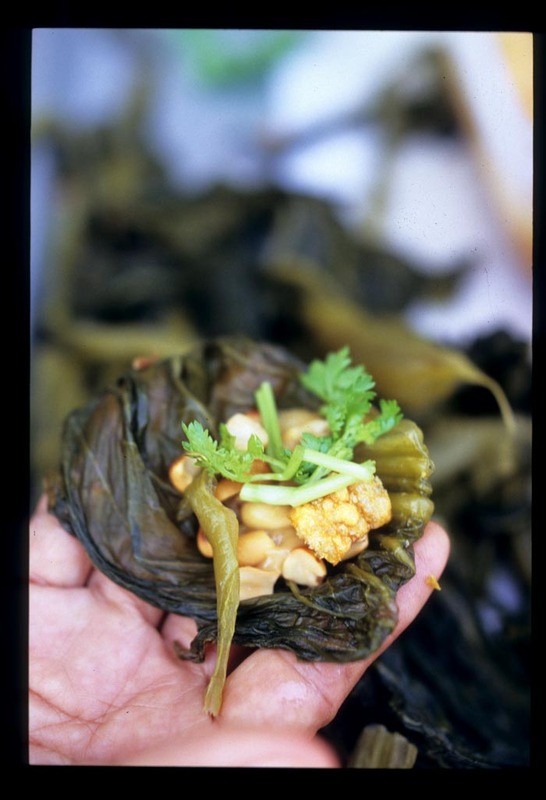 The leaves serve as the treat's wrapper, while the stems are chopped and added to a filling that also includes roasted peanuts, namtaan bpeep (sugar from the palmyra palm) or namtaan ooi (brown cane sugar), deep-fried pork skin, and cilantro. The bundle is popped into the mouth with a whole fresh chile. An odd combination, perhaps - sweet palm sugar and salty, bitter cabbage leaves - but, like many dishes served in the north, surprisingly addictive. 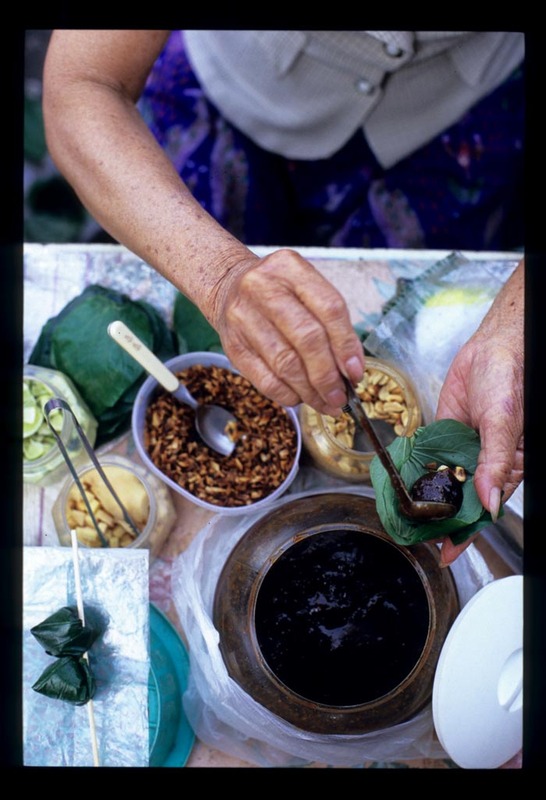 Miang Lao should be made to taste, so no exact amounts are given. 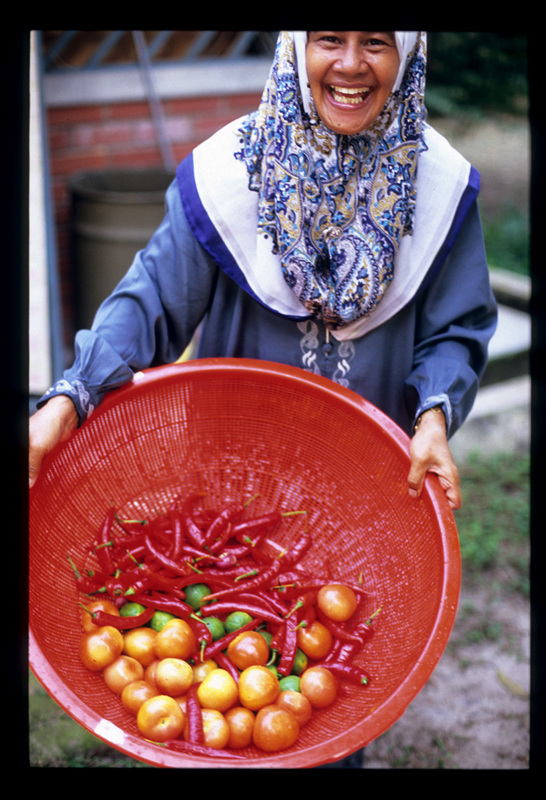 If the thought of a whole chile is more than you can bear, chop the chilies and add in small amounts to the filling. These treats are best made shortly before serving so the pork skin doesn't get soggy. They go very well with an ice-cold beer. 1. Rinse and dry the cabbage leaves, taking care not to tear them. Remove the stems, chop and set aside. Arrange other ingredients in separate bowls. 2. Spread a cabbage leaf on a plate with the stem end facing you. Add a pinch or dab of sugar, a couple of peanuts, some pork skin, a bit of chopped cabbage stem, and a cilantro sprig. Don't overload the leaf - the result should be bite-size. Roll the leaf, fairly tightly, from bottom to top, tucking the sides in as you go. 3. Enjoy with a whole chile.